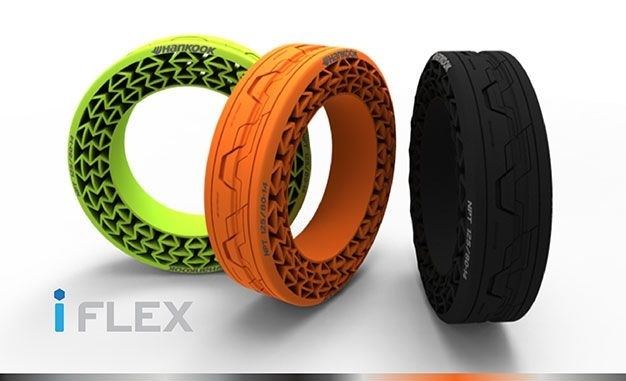 Airless tires are one step closer to becoming a production reality, after Hankook successfully put its iFlex tire through a series of high speed tests. The iFlex is Hankook's fifth attempt at non-pneumatic tires, and brings with it a number of environmental benefits compared to conventional tires. As you might have guessed from the name, non-pneumatic tires don't require any air. Instead, Hankook's iFlex eschews conventional construction for a material that the company says is energy-efficient to manufacture and easy to recycle. The material also has allowed Hankook to halve the number of steps involved in manufacturing. In testing, the iFlex was put through its paces in five different categories: durability, hardness, stability, slalom and speed. The electric car Hankook used hit 130 km/h (81 mph) without damaging the tire, and the iFlex was able to match the performance of a conventional pneumatic tire in all the other tests although further details about the results have not been revealed. Hankook isn't the only company testing airless tires. Michelin has opened a North American plant dedicated to production of the Tweel, and Bridgestone has been testing its recyclable, puncture-proof tires on Japanese single person vehicles that are usually used by the elderly. Although still in the testing phase, the airless tire has huge potential in production cars. They don't puncture, and depending on the materials used they also have the potential to significantly cut down on the emissions involved in the production and recycling of tires.